Would you like a piece of cake right now? For Goodness Cake is here for you. Today: The story of a person who rejected birthday cake for his birthday—and the cheesecake he got in its stead. It's hard to make a birthday cake for someone (especially someone you care about) who doesn't like cake. I tried to fight it—to offer a pistachio cake or a chocolate-chocolate cake or even the Neopolitan refrigerator cake his grandmother used to make every year for his birthday (with cake mix and Jello-mix and instant pudding mix)—but nothing would bait the birthday boy. So I turned to the least cakey cake I knew, the one that would rise proud like a layer cake and support a candle or two but would not resemble cake in any other way: cheesecake. A lot of people have a lot of feelings about cheesecake (see chart below): Some love it; some love it but are scared of it (the potential for a leaky water bath, the potential for cracks, the potential for the bricks of cream cheese to squash you); and some—under the guise that it is either too rich or too dry or too lumpy—hate it. 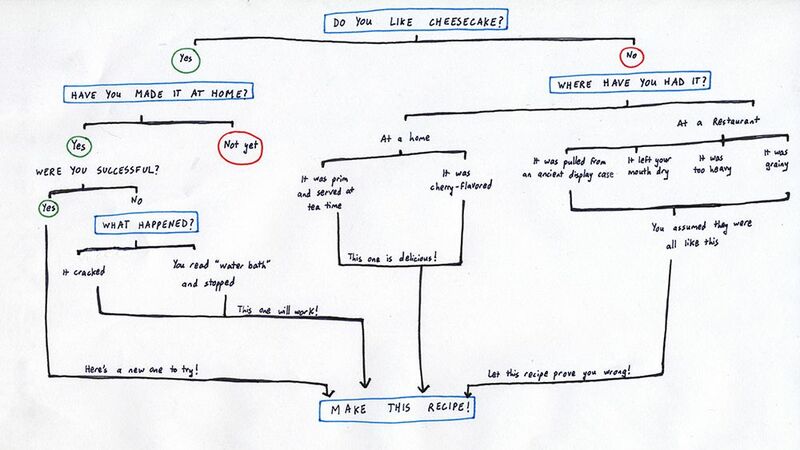 Before I was coerced into making cheesecake for my loved one's birthday, I, too, was in the conflicted camp. Cheesecake was a four-bites-and-please-put-me-to-bed dessert—certainly not one that could stand in for birthday cake, which literally keeps track of the years of our lives in frosting and sprinkles. But this cheesecake—basically just pudding wearing a girdle—made me think differently. More: Alice Medrich's tips will stop cheesecake cracks in their tracks. To the people who love cheesecake: Please try this recipe. It will solidify your passion. It has a Nilla Wafer crust. To the people who are scared of cheesecake: Please try this recipe. It will yield a silky-smooth cheesecake with neither a water bath nor sorcery. As long as you are careful not to overbeat the batter once the eggs are added, the surface will remain crevasse-free. 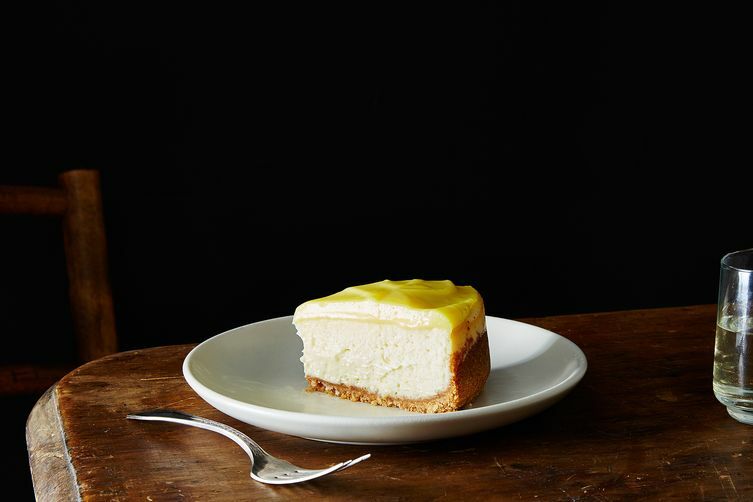 And, to the people who hate cheesecake, I say this: You just haven't had a good one—yet! Here's the recipe that will change your mind. It's tall and silky and your fork will slip through it, frictionless. 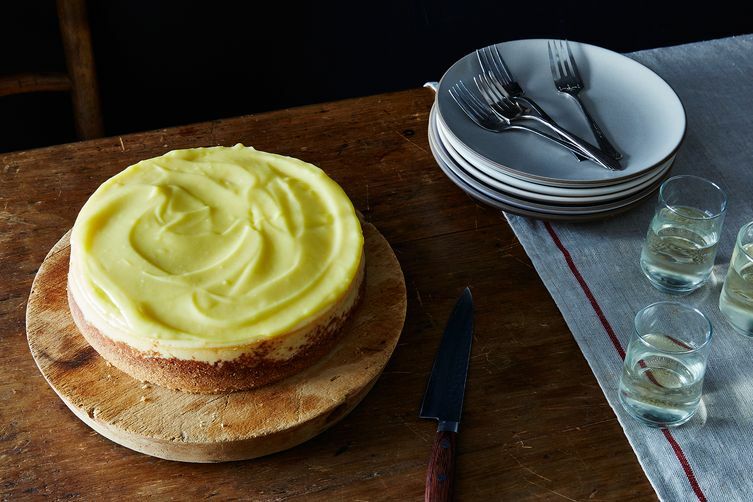 It's creamy and luxurious, but the top layer of lemon curd (I've used Elizabeth Falkner's recipe from Genius Recipes, as well as Tartine Bakery's version) cuts the richness with acidic brightness. It's got enough cream cheese in it to schmear two dozen bagels, but it will leave you feeling sprightly. A tart, sunny topping hovers over several inches of a milky, tangy, and skimmable custard that is the texture of thick pudding, just barely bolstered by a couple tablespoons of flour. It's what you like about panna cotta or flan—how responsive it is to your fork's every move—with none of the weird gelatinous jigglyness. The cake isn't haughty, either: Tweak the details as you see fit. You could use grapefruit or lime in place of the lemon; you could switch out the Nilla Wafers for graham crackers or even Cracklin' Oat Bran. Because the honoree loves Jelly Bellys, I covered the lemon curd in a jelly bean mosaic (juicy pear at the center and all black licorice disposed of). The person who blew out the candles was thrilled—and no one made a peep about birthday cake. But should cheesecake be like flan or custard? I hate flan and custard because they're too eggy, and cheesecake is never eggy. You had me at Cracklin' Oat Bran, but then lost me with the ricotta. I'm also more of a fan of the dense kind of cheesecake, and mass produced ricotta never enters my home. I assume that small batch, crumbly, dry ricotta wouldn't result in the intended silky texture you want here. It looks lovely, but I'm more a fan of the dense, crumbly, less sweet styles of cheesecake (European and NY) than this style. I agree, 'Nilla wafers are gross, but the cat cookies sound like a good choice. Will probably go the Speculoos route, making my own, of course. Or perhaps I'll turn to my favorite cheat, Trader Joe's cat cookies, which have a similar but lighter spice blend. They're a lot like Annie's rabbits. They're probably made by Annie's, in fact. I'm in agreement on the Nilla wafer crust Antonia! yuck. I was thinking on doing a brown butter crust or trying out the Cracklin' O's cereal crust. What's Speculoos? Never knew that about TJ's cat cookies. Must try them. When I first saw those I thought they were treats for cats. Eatdrinkpurr - Cherries, yes! Not sure if they'd bleed too much, though. Maybe I dip them the cut sides in apricot jam first? And about those cat cookies, they're fantastic in any recipe calling for 'Nilla Wafers, even though they're not as soft. I use them in bourbon balls, etc., too. They have the lightest cinnamon taste with a fair bit of vanilla. The chocolate ones are also terrific for crusts and bourbon balls, too! You need to blitz them well in a food processor, however. Speculoos (also called "Speculaas" or "Biscoff" cookies) are Belgian spice cookies with a lot of ginger in them, similar to our gingerbread cookies here in the US, but without any molasses, so the spice flavor comes through nicely. Cracklin O's would be a nice alternative - a bit more rustic, and sweeter, but with a great spice flavor. I've been meaning to do a French style cheesecake, which actually has a pastry crust, sort of like a deep dish cheese pie. And the filling is light and fluffy, due to beaten egg whites folded in. That lemon curd is calling my name, however, and I still have a few ripe Meyers on my little tree, so the time seems right. ;o) P.S. My husband of 30+ years doesn't like cake nearly as much as he likes pie, so I always make a birthday pie for him instead. It's his birthday, after all. I have never felt the need to convert him to cake-ism. He appreciates that. Teresa, I bailed on this, given that my son and I spent quite a bit of yesterday making brioche rolls and loaves from the Tartine Bread book - very labor intensive but four hands made lighter work of it. I went rogue, making a mash up of Medrich's mocha chocolate cheesecake and testkitchenette's "Mom's Skinny Cheesecake." https://instagram.com/p/4uVE3rmB3V/?taken-by=howmothercooks Then I went and made a second one, because I had leftover ingredients for which I had no other immediate use. I'm taking both to our annual Independence Day block party in about an hour. ;o) P.S. For this crust, I'd use the Trader Joe's cat cookies (plain), but I'd add lemon zest + nutmeg (or perhaps cardamom! ), along with some toasted pecans, for even more flavor. I added toasted pecans to the chocolate crusts. Such a good idea, if I may say so. I am 100% sure that "pudding wearing a girdle" is my favorite thing I've read all month. Me too! Also this flow chart! I have a cake-rejecting birthday person who I made a XL bucket of Merrill's banana pudding for once. With Nillas. I want a bucket of banana pudding.